For the 2018-19 school year, Valley View School District will begin using a new student information system called Infinite Campus. This system includes Family / Parent and Student Portals, that provide families and students with real time access to homework, grades, attendance, behavior, student fees and more. Families and students can access their portals via a secure website or an app on iOS/Android devices. Infinite Campus Family / Parent & Student Portals align with Valley View School District’s Strategic Plan - Goal 4, Strategy 8 - building partnerships and connections with families that are aimed at improving student achievement. As well as Goal 5, Strategy 9 - providing R.A.I.S.S.E - Reliable, Accessible and Equitable Technology - More information about Valley View's Strategic Plan can be found at www.vvsd.org/StrategicPlan. 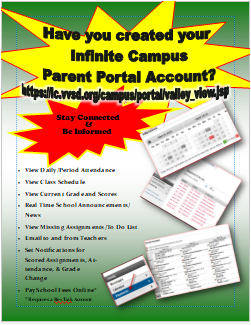 VVSD Families will receive this flyer that includes instructions on how to create their Infinite Campus Parent Portal Account for viewing student academic information as well as a RevTrak account for paying school fees. 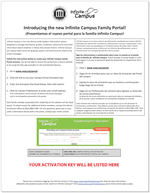 VVSD Families received this letter in the mail, with their activation key to create their Infinite Campus Family Portal account. Letters are sent with all grade reports (back of report card) for families with middle and high school students; or separate mailing for families with elementary school and STEP students.